Every four years I have people ask me if I understand the Electoral College, and if I can explain it to them. I do not write about religion, politics, or money here and I am not going to change that policy now. However, I think everyone should understand how the Electoral College works and why we have it. 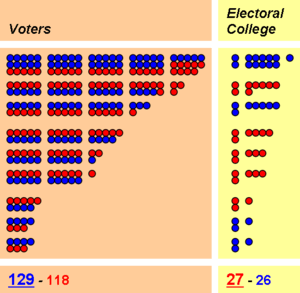 Each state would have a specific number of electors in the Electoral College based on their number of representatives in congress; one elector for each senator (two each state) and one for each congressperson (which is based on the size of the population of the state). The 23rd amendment to the constitution gave Washington District of Columbia the same number of electors as the least populated state. The state with the most electors is California with 55, and the states with the least electors are Alaska, Delaware, Montana, North Dakota, South Dakota, Vermont, Wyoming, and Washington District of Columbia, all with three each. In the 1700’s this kept New England from dictating to the rest of the country who the president would be. In the 21st century, it keeps the huge metropolitan cities (New York, Atlanta, Chicago, Detroit & etc.) from dictating to the rest of the country who the president will be. In most cases, the presidential candidates usually spend their time campaigning in the larger states (California, Texas, Florida, and New York) and a combination of smaller states that they believe will give them victory. We all know about the infamous 2000 election, but there was something else different about that election most people forget (I will not comment on the controversial aspects of that election or approve ANY comments on the controversial aspects of that election … no arguments here, there are too many arguments in the rest of our lives). This election did not follow the usual campaign strategy. Candidate Al Gore put his effort in the largest states and Candidate George Bush put his effort in the smallest states. 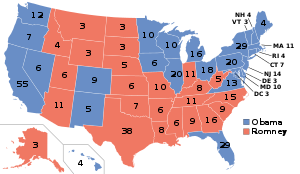 If a candidate wins only California, Texas, Florida, New York, Pennsylvania, Illinois, Ohio, Michigan, Georgia, North Carolina, and Virginia (just 11 of the 50 states, 22%) that candidate wins 271 electoral votes and the election, only 270 votes are need to win. 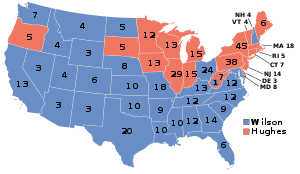 Candidate George Bush’s campaign strategy was to put the most effort in the smaller states, 25 of the 50 states have seven electoral votes or less. In the end, the official verdict was that candidate Al Gore narrowly won the popular vote, and candidate George Bush narrowly won the electoral college vote. This was not the first time (nor will it be the last) that a candidate will win the popular vote and lose the election. Many people think this is not fair and the election should be a straight democratic vote. If it was a straight democratic vote, a candidate would only need to worry about the majority; win them and win the election, the minorities in this country could be safely ignored by the candidate. However, the way the system is now, catering to the majority is no guarantee of victory. A candidate must also address the concerns of the minorities as well because the candidate may need them to win. In a straight democracy it does not matter what the law is, the majority is the law, the mob rules. In a republic the law rules and no one is above the law. The law applies equally to all citizens. “Wait” you say, “I can give you many examples of people not treating everyone equal under the law.” Yes you can, and so can I. In each of those cases, if you do the research, you will find that those instances came about because of a flawed democratic process. Take the Jim Crow laws, the bigots had large numbers of people on their side to pass laws in elections and to elect politicians who would legislatively pass laws creating the Jim Crow laws but they did not have enough people to insure victory for their side. So, they used illegal tactics and groups like the Klan to intimidate voters opposed to their plans. In the end, our system is not perfect; but it is the best system devised so far to insure that the voice of all the people has influence, and not just fifty percent of the people plus one with all the power. Another way to say this is that in a straight democratic vote, fifty percent of the people minus one always loses every time. No need for compromise, just the majority with all the power at the expense of the minority, every time. So much for the fairness so many people seek. Tagged as Abraham Lincoln, Al Gore, Electoral College, George W. Bush, History, joeccombs2nd.com, John Quincy Adams, Rutherford B Hayes, United States, Washington D.C. This is a shame. Several years ago they voted against allowing submariners without World War 2 service to join their organization. Several members disagreed with this vote and left to start a new submarine organization, United States Submarine Veterans Incorporated. What I like about immigrants is that they know why they are here. They know what America offers them. They know America’s great gifts and great faults. They are glad to be here and often come with only the clothes they are wearing and little more. They take whatever jobs they can get, no matter what the pay. They work hard and never look back. They know the opportunity that awaits them here. They know they will not “make it” the first time, and maybe not the fifteenth time. But they know they will make it, they know the opportunity is there and with hard work they can achieve their goals. They just don’t quit. When they make it they give back to the community and think nothing of giving a hand up to others to help them succeed too, and will tell you about every person who helped them. They also know more about our country and its history than most Americans. This week I met a man from Venezuela and we discussed the great hero Simon Bolivar. 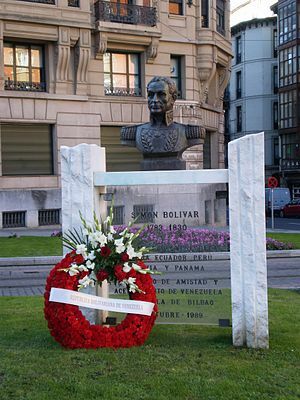 (I am writing an article about him, if you don’t know Simon Bolivar you need too. He has always been a hero of mine.) The next person I met was a man who immigrated from Moscow. We had a long conversation, but then I love Russian people, my daughter is half Russian, and I can’t wait to get back to Russia for another visit. Great history great people. As if that was not enough, my daughter Elizabeth has decided to start her own business making jewelry to help mom and dad. What a kid and only 7 years old. I started to explain to Elizabeth what an entrepeneur is and what it takes to start a business. (I wasn’t talking about a lemon aid stand.) So, we went to a craft store and started taking count of what she needed to start her jewelry making business. 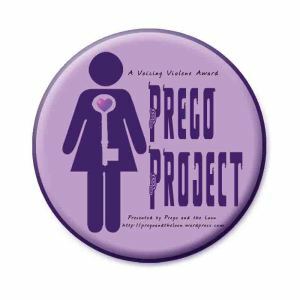 We met a wonderful woman who has her own jewelry making business and talked with Elizabeth, adult to adult, about the good and bad of the business, while also giving Elizabeth some great advice. So, Elizabeth has her business plan (she did it, not dad) and her short and long-term goals. I agreed to be her banker to get her started, and since she is my daughter and I love her so much, I told her I would loan her a start-up at 0% interest while explaining the interests a bank would charge and why. So, I guess my 7 year old daughter is a business woman now and she has done it on her own. Now if that isn’t a week to pick you up and get you going, I just don’t know what is. I hope you have a great week too! Take care! Years ago I used to play in “Dead Pools” where you would pick celebrities who you thought would die in the coming year, and I became acquainted with Stephen King’s brother-in-law who was a fellow player. They both went to the University of Maine and married sisters. I remember 5 1/2 months ago when I wrote my article on the AS Hindenburg I thought to myself “It will not get many reads, but I have always been interested in the Hindenburg.” So, I wrote the article and posted it. Well, last week for the first time since I posted that article it was finally knocked out of the number one spot for most weekly views. I hear you and will be writing more about zepplins in the future. You really are the best readers a writer could have.